Why? He was kind enough to write an answer to that very question for us. 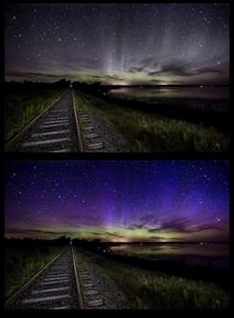 The simplistic answer is because human eyes can’t see the relatively “faint” colors of the aurora at night. Our eyes have cones and rods – the cones work during the day and the rods work at night. Thus the human eye views the Northern Lights generally in “black & white.” DSLR camera sensors don’t have this limitation. Couple that fact in with long exposure times and high ISO settings of modern cameras means the camera sensor has a much more dynamic range of vision in the dark than we do (duh!). The same thing is true regarding the Milky Way and night photography in general. 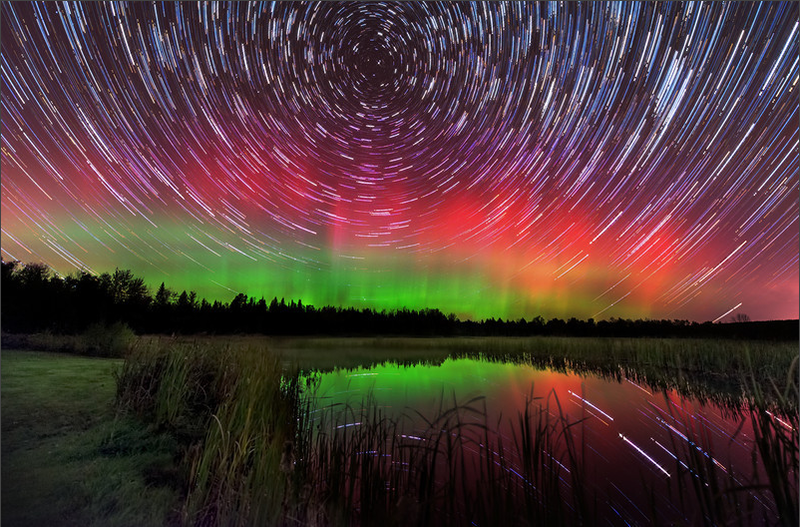 Some folks claim that they can see many colors during an aurora display and that very well may be. I have definitely seen light shades of green, red, and violet/purple but I can only speak for myself and my empirical knowledge – your mileage may very. 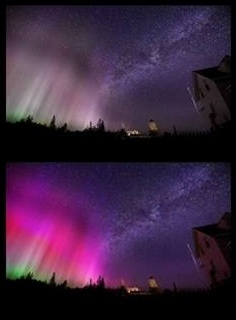 The farther North your viewing location, the more colors you can actually see because the aurora is stronger. I made the above graphic to show what I mean. 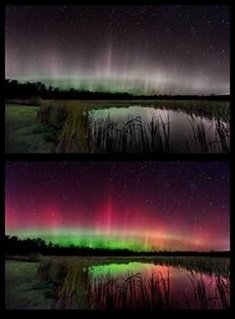 These three photographs exemplify the most impressive aurora displays I’ve seen. The top row of images have had the skies desaturated by color (green, yellow, red, magenta, purple, blue) to show what I saw with my eyes. A bit of green has been retained on the horizons and just a bit of the color that I remember seeing above that – red, violet, and red respectively. *Warning: quick paragraph of camera lingo – non-photographers tread lightly. FYI – I generally set the white balance on my camera to Kelvin 3450 – 3570 when shooting the features of the night sky but I will also take a few frames with it set on Auto to see what colors the camera thinks it should be capturing. Most times I end up going with the Kelvin setting, which is a little bit on the cool/blue side of the spectrum. The EXIF data for these shots are K-3450, K-3570, K-3570 respectively. 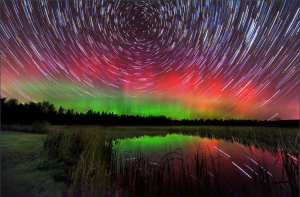 I process all my photos through Lightroom 4 & Photoshop CS5 and I certainly have an “artist’s view” when bringing an image to life but when it comes to these strong aurora scenes, the colors have not been saturated very much because Mother Nature did that work beautifully. *Take a deep breath, you survived. I saw “dancing lights” in the sky, spiking straight up starting around a few hundred feet off the ground. They waved a bit like curtains but stayed in basically the same area. They seemed to be kind of a blur though, the “spikes” were not very defined. There was definitely a green hue on the horizon and a bit of red color above that but I didn’t see the crazy red & magenta colors that my camera recorded. I saw what appeared to be white/grey “curtains” dancing along the black sky. I didn’t see much of anything but I set up, starting shooting and immediately saw green on the horizon on my camera screen. I set the camera to shoot 30 second exposures for an hour with just a few seconds in between so that I could quickly review the scenes on the LCD screen as my camera snapped away. Within 10 minutes or so, I saw sharp spikes or columns shooting up and slowly moving across the sky. To my eye they appeared to be a light violet/purple color enough that I actually posted a status update to Facebook at 2:24 AM that said “You know the aurora is cranked up when you can see the purple spikes with your naked eye.” When the display died down, I quickly looked through my images but I didn’t really know the spikes were blue until I viewed them on my computer. The most impressive oval I’ve ever seen, a perfect arc which covered the Northern sky’s horizon. The tallest and most crisp “spikes” I’ve witnessed, reaching all the way to the stars. Again I saw definite green around the oval at the horizon but the spikes themselves were white/grey, not the intense red that my camera captured. I hope you found this information useful! I was inspired to write this post by my friend Stewart Watt who recently posted a desaturated image of an aurora he viewed in the hope of helping to explain what the Northern Lights actually look like to the human eye.